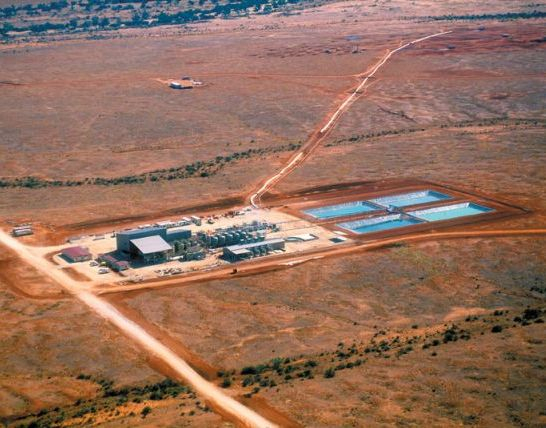 THE biggest mover this morning on a generally negative day for the resources sector so far was Alliance Resources, which was up almost 25% by midday on the back of high-grade drilling results from its Beverley 4 Mile uranium joint venture in South Australia. At the Australian Uranium Conference held in Fremantle recently, Alliance general manager Steve Johnston was itching to offer a grade for the mineralisation during his presentation but deemed it “irresponsible”, given a resource for the project would not be ready until later in the year. This was, however, an indication of Alliance’s confidence in the high-grade nature of the Beverley 4 Mile prospect. Results released today include 9m grading 1.66% uranium and 9.5m at 0.97% uranium calculated by prompt fission neutron (PFN) logging. Alliance says the results are subject to revision once geophysical logging takes place. The results come from the high-grade Western Zone of mineralisation at Beverley 4 Mile where drilling with three rigs continues in order to calculate a resource before the end of the year. The project has an exploration budget of $3.5 million for 2006. The project is run by Alliance’s joint venture partner Quasar, the exploration arm of Beverley uranium mine operator Heathgate Resources. Alliance has a 25% free-carried interest in the project until a decision to mine. The Beverley mine lies just 8km from the 4 Mile prospect. Shares in Alliance were up 8c (23.2%) at 42.5c by midday. Approving a uranium mine in South Australia was not a decision taken lightly, federal Environment Minister and former anti-nuclear campaigner Peter Garrett says. The former Midnight Oil frontman – whose repertoire includes songs against the nuclear industry, such as Dead Heart – announced on Tuesday the approval for the Four Mile Mine, 550km north of Adelaide. The Australian Conservation Foundation (ACF) has condemned the mine, saying its chemical and radioactive waste will leach into groundwater. But Mr Garrett said he had “set the bar to the highest level” to protect the environment, and would apply world’s best practice to regulation. “I made absolutely sure before taking what was a difficult decision that I received expert advice from Australia‘s best scientists,” he told reporters in Melbourne on Wednesday. Standing on the stage of the Esplanade Hotel in Melbourne, Mr Garrett denied he felt compromised by the decision. “I joined the Labor Party, I became a member of the government,” he said. “And I said at the time that I would accept as a team player the decisions that government took. He admitted he had “strong views” about uranium mining. “We had the opportunity to canvass those views … that debate has been settled by the national conference and the policy of the government is clear,” he said. He refused to rule out approving further uranium mines, but said that was a matter for state governments “as to whether other proposals come through”.